Plus, our new feedback form and updates to our help site! Only a month into the new year, Less Annoying CRM's dev team is hard at work improving the CRM. In addition to big projects coming down the pipeline (including an overhaul of our custom fields feature), they've been working on knocking out small feature improvements that I'll cover in this month's Small Update Digest. If you want to read past updates, be sure to check out our Product Update tag on the blog. You can also subscribe to our newsletter if you want updates sent straight to your inbox twice a month. 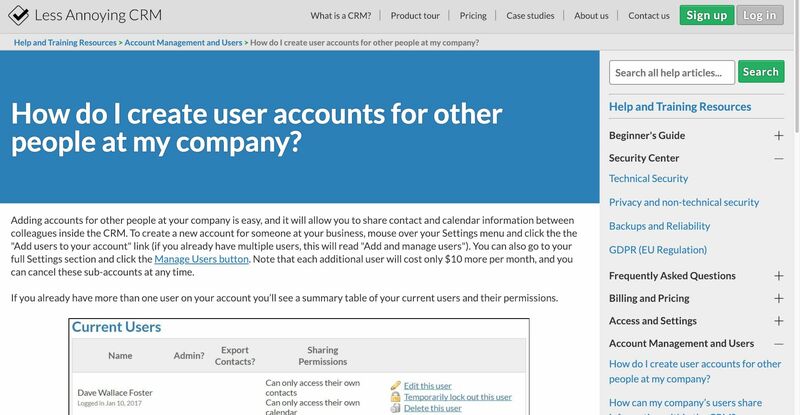 Account administrators now have more control over deciding what kinds of data their users can (or cannot) export from the CRM. Before, an administrator could give a user no exporting privileges, or full exporting privileges -- there was no in-between. Now, administrators can decide if a user should have privileges for exports, syncing, and API access separately. You can toggle permissions separately for exporting, syncing, and API access. In order to edit your current users' permissions, administrators can head to the Manage Users page under Settings and edit any of their users. If you're not sure which permissions you should choose, check out this article that outlines all of the new advanced exporting permissions options. We've updated our feedback gathering system so that we can better identify how we can improve! Now, we request feedback from every single customer, not just account owners. By receiving feedback from more of our users, we'll have a better idea of how we can improve the user experience overall. 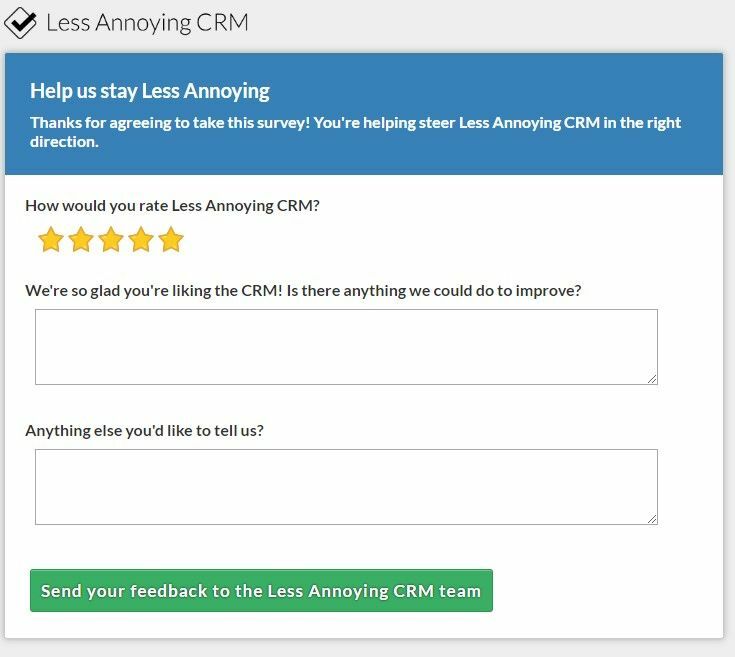 If you are an LACRM customer, you'll receive a feedback request like this! We also shortened up the survey (it's just two questions now, in addition to a star rating) so that folks can focus on what is really important to them. We really do read every piece of feedback, so be sure to give us an honest rating, and let us know if there is anything we can do to stay less annoying. Don't be shy when filling out our new feedback form! We'll send out our feedback form annually, but customers can always contact us if they have more feedback to offer! If you've checked out our help site recently, you'll have noticed some changes! You can now view all of our help articles from one page, and when you click on an article, we'll include a righthand side bar so that you can easily find the next tutorial you're looking for. You can search for help articles or click through our menu on the side bar! In addition to updating our help site, we're also working on changing the way we organize our help tutorials. If there are any specific tutorials you've been looking for, let us know! We can always help you find what you need (or write a new tutorial if we don't already have one! ).